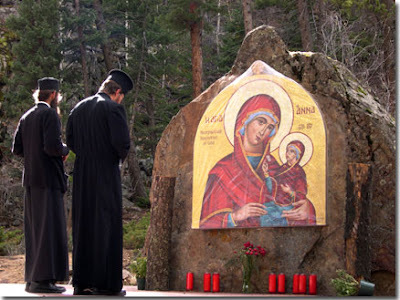 Saint Anna's Chapel in Dumont, Colorado is on land in the Colorado mountains that was a private donation to the Greek Orthodox Church. They built the chapel around the natural rock fomation that you see in the photo. This mosaic is hand-created. It depicts the Grandmother of God with the Virgin Mary. Saint Anna's retreat was named after the benefactor, who bears the same name as the Grandmother of God. A sign at the chapel declares, "nothing is more sacred than motherhood." This retreat is peaceful and the spirit of God is present. Besides the chapel, there are trails which lead to other sacred icons besides rippling streams. One can rest by the Virgin Mary icon to reflect, pray, and be still. All are welcome to visit. The retreat is located a mile west of Idaho Springs, Colorado. Exit at Dumont and go north on Old Mill Creek road for two miles.